An economical and efficient system to organize and store your specimens in a freezer. Corrosion-resistant stainless steel racks compatible with the major brands of laboratory chest freezers. Racks have handles to easily place or remove from your freezer. These racks store boxes up to a 135 x 135mm footprint and accommodate 2" tall boxes (up to 5cm) to 3" tall boxes (up to 7.6cm) depending on the rack model. 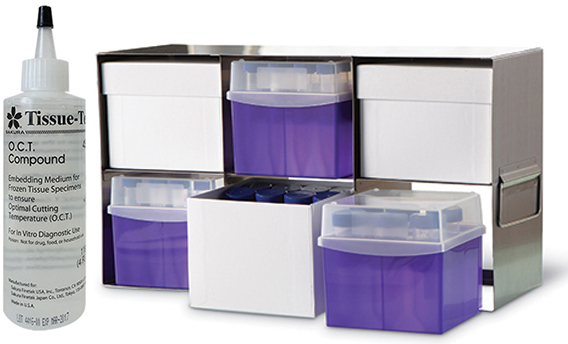 For use with Cryostore™ and True North™ Freezer Storage Boxes for Tubes from 1.5/2ml to 50ml. Cube Freezer Racks for use with Cryostore™ and True North™ Freezer Storage Boxes for Tubes from 15 to 50ml.